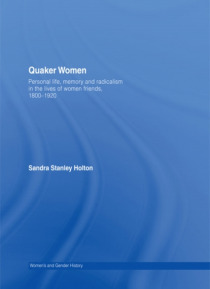 One nineteenth-century commentator noted the 'public' character of Quaker women as signalling a new era in female history. This study examines such claims through the story of middle-class women Friends from among the kinship circle created by the marriage in 1839 of Elizabeth Priestman and the future radical Quaker statesman, John Bright. The lives discussed here cover a period from the late eigh… teenth to the early twentieth centuries, and include several women Friends active in radical politics and the women's movement, in the service of which they were able to mobilise extensive national and international networks. They also created and preserved a substantial archive of private papers, comprising letters and diaries full of humour and darkness, the spiritual and the mundane, family confidences and public debate, the daily round and affairs of state.The discovery of such a collection makes it possible to examine the relationship between the personal and public lives of these women Friends, explored through a number of topics including the nature of Quaker domestic and church cultures; the significance of kinship and church membership for the building of extensive Quaker networks; the relationship between Quaker religious values and women's participation in civil society and radical politics and the women's rights movement. There are also fresh perspectives on the political career of John Bright, provided by his fond but frank women kin.This new study is a must read for all those interested in the history of women, religion and politics.